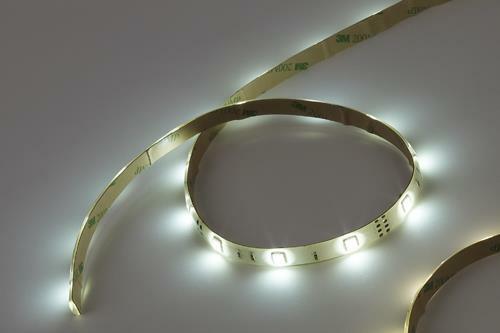 12 or 24 volt DC Flexible High Output (HO) LED Interior Tape Light has extra high output in low-profile form factor. 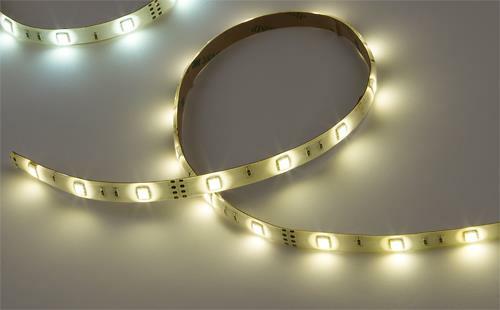 Linear strip of HO LEDs are energy-efficient and extra bright, making this Strip Tape perfect for high-visibility boat lighting in confined spaces. Wide angle, high-output LEDs placed every 1.3" result in high-brightness marine lighting with very low energy consumption. Thin, flat and clear epoxy resin protects the SMD technology to keep your interior tape lights protected from daily marine wear and tear. Easily installed anywhere with supplied 3M tape already attached to reverse of strip. 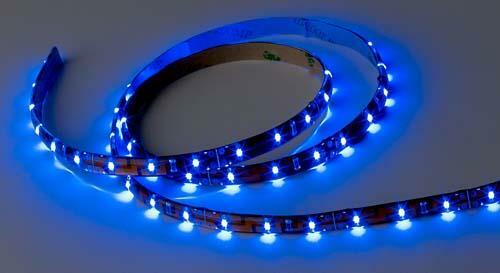 For extra mounting security, consider trying our Mounting Straps for LED Tape Strip. 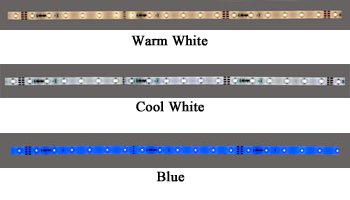 Each section has wire leads so your LED tape strip is ready to connect to your DC power source upon delivery. Please note that flexible 12 volt strips may be cut every 4 inches while 24 volt strips may only be cut every 6 inches. Applications for High Output tape lighting are varied: glass cabinet highlights, wine rack illumination, closet customization, cove light accentuation, and so much more. Available in 12 volt DC tape light in 4, 8 & 16 foot lengths as well as 24 volt DC tape light in 5, 10 & 20 foot lengths. LED Color: Warm White (46 Lumens/ft, 151 Lumens/m), Cool White (46 Lumens/ft, 151 Lumens/m), Blue (46 Lumens/ft, 151 Lumens/m) or Red. LED Color: Warm White (59 Lumens/ft, 194 Lumens/m), Cool White (46 Lumens/ft, 151 Lumens/m), Blue (46 Lumens/ft, 151 Lumens/m) or Red.